A Day Dreamer's World: How to Buy For a Bibliophile! How to Buy For a Bibliophile! I'm sitting at my desk with the heating turned up to almost maximum, wearing a too-small fleece(the only thing known to keep me warm) and some fluffy blue socks I had last Christmas. There's an outline of a few posts I need to write before the end of the year, an ink pen without its lid and a chewed pencil I now refuse to pick up. And I actually have some time to sit down and blog for the first time in a month. Hibernating for a few weeks wasn't planned. With revision for January exams, prep for Mocks and an almost endless 'To Do' list, I forgot about the ever-growing TBR waiting for me. And that I was meant to open my Advent Calendar every day this month. Now that the holidays have finally begun, I thought I would piece together a guide for anyone who is trying to buy for a bibliophile this Christmas(and rushing their shopping last minute like I am). Whether you're buying for a best friend that spends most of the day sitting beside you at school or a fellow blogger online, the best way to decide on a gift is to simply ask. Maybe question them on what they have read recently or ask who their favourite author is? Pester them about what is on their Christmas wishlist? If that friend does send back a list - pages long like I would - featuring all the books that they hope to find beneath the tree, then you're job is merely ordering them online or heading to your local bookstore to pick one of them up. When there's not an entire list to base your Christmas shop on, attempt to use what they have read recently when it comes to choosing a book, but make sure that they enjoyed it! After meeting up with a friend at Starbucks a few weeks ago, I knew that she wanted to read The Fault in Our Stars, so all I had to do was work out what else to put in the gift bag like one of Santa's Elves. If you know the person you are buying for has an online presence, don't miss the opportunity to scroll through their social media accounts for some ideas. Many booklovers use Goodreads where you can easily access the wishlists of those you may be buying for, and usually it comprises of pages of paperbacks and hardbacks. If you have already selected a book and set it aside, waiting to be wrapped and sent before Christmas Day, it could be worth checking their 'read' list. Otherwise, the novel will spend the next year sitting upon a shelf collecting dusk, unwanted as they have read it before. If you are buying for a blogger, then scrolling through their site is a must. There could be a wishlist you are yet to read, or a review archive that you can take a look through for some inspiration. After searching through multiple websites and social media accounts, choosing a novel at the bookstore should have become a little less daunting. Selecting gifts for friends, and strolling around the shops searching for that one item that I know fits with their interests, is one of my favourite parts of the holiday season. Although, it does result in a few hours spent trying to find the copy of the book with no bent pages or creases in the covers. ﻿﻿If you want to make sure that a gift bag or package is being sent crammed-full of gifts, then you can follow a theme when choosing a few smaller items. Usually, I decide on a 'main gift' and pick up a handful of other stocking-fillers based around it. When it came to picking up John Green's novel for my friend, I chose to use the colours of the cover - white, blue and black - to fill the rest of the bag. I was soon wrapping a selection of nail varnish to match and a box of chocolates ready for when the comfort-eating kicks in! Afterwards, I realised I should have included a box of Kleenex! Can you really blame me for adding the glasses? Along with the colour of the cover, you can also use the setting or plot as a theme for your friend's Christmas gifts. There's the likes of London, Tokyo or New York to choose from if you're buying for a Geek Girl fan, or for those who love Stephanie Perkins, then you can also buy Paris-themed items to match the novel. Using successful franchises is also my safety-net. Simply picking up a Mockingjay Pin or Divergent poster - to co-exist with the books - can help create the perfect Christmas package; merchandise for these popular series' can be found almost anywhere. 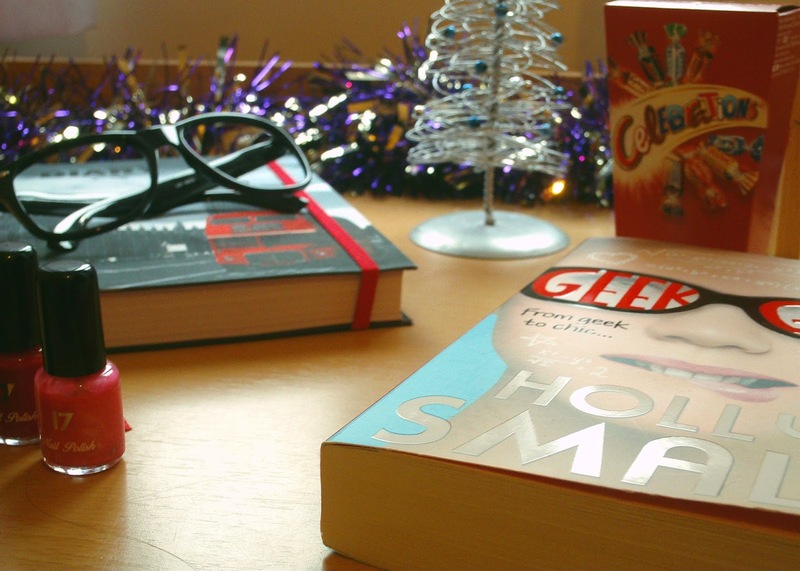 Choose smaller stocking fillers that match the cover! As an example for this post, I decided to piece-together a possible gift bag for a bibliophile, based on Holly Smale's series. Since it is a popular UKYA novel, and Harriet spends most of the first novel in England, I decided that a notepad I recently purchased would fit with a 'Very British' theme. 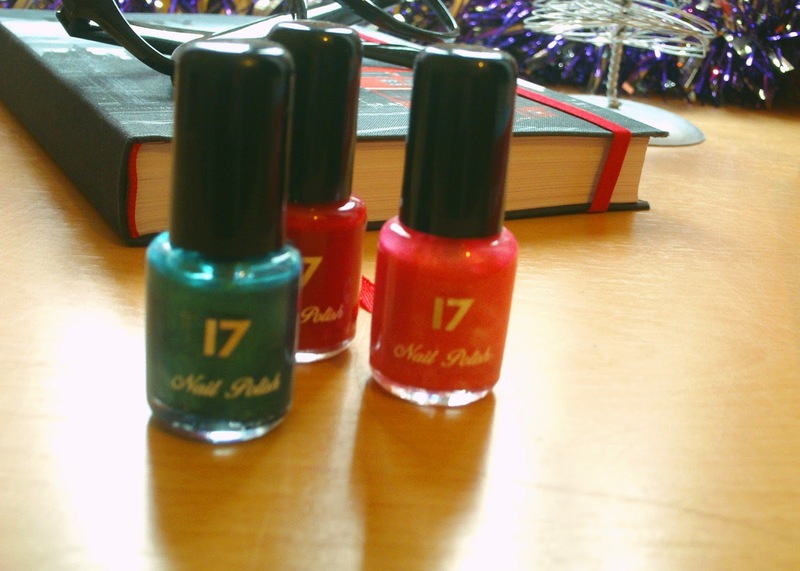 Whilst I resisted the urge to add some tea bags, I managed to find nail varnish to match the book's cover, and a selection of chocolates with a red-packet - to tie-in with the Union Jack. Remembering Harriet's love of lists, there is also a copy of the Literary Listography, something the main character herself would probably want to own. 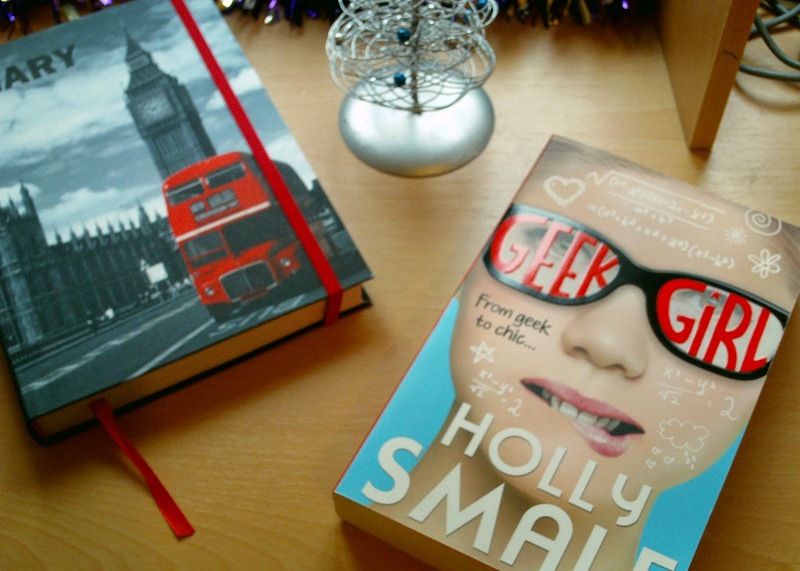 Literary Listography - the perfect gift idea - and Geek Girl. decorated with Santa and his sleigh, I decided to not wrap these in fear of running out! When you are adding the finishing touches to your gift, simply add a decorative bow or ribbon to the package, and make sure to add name tags if you're buying more than one! Unlike most gifts, you won't be able to shake it to work out what it is! Have you made any bookish purchases this year? Or are there any books on your own wishlist? Thank you, Rita! It just makes me feel more organised, as I tend to leave shopping until last minute! Thank you! If you do use it, make sure to tell me how it goes!